Team books can be so cool, especially when they’re written right. You don’t focus on one particular member of the team, say Superman or Batman, but on the team as a whole. Now, add a great writer who’s already doing this, and then have him add two more teams to that. Sensory overload? No way! Now, you’ve got a whole bunch of your favorite characters, all in one book, and all part of a major storyline. YES! For a time, DC Comics would have an annual event that brought fans of the Justice League and the Justice Society together for an epic storyline. You’d get to see the likes of Superman, Batman, Powergirl, the Flashes, Green Lanterns, and many other multiples and singular heroes come together to save the world. It’d be great, and fans would look forward to that next meeting a year later. Here, we have the meeting to start the decade of the ’80’s, and what a way to start! The Justice League, the Justice Society, and the New Gods? What on both earths could possibly be going on to bring all three of these groups together to save the fabric of space and time? Let’s find out in this weeks Back Issue Bin to the Future as we watch the events unfold in Justice League of America #184! We’re smack-dab in the middle of a three-part storyline, so the first page gives us a recap: Metron summons 4 members each from the Justice League and Justice Society to inform them that a cosmic kidnapping has taken place. The entire population of New Genesis has been taken to the dreaded world of Apokolips, by those nasty evil-doers from the Injustice Society (that almost hurt me to type)! A plot has been uncovered, and with the help of the New Gods, all three teams are going to try to prevent Darkseid from returning! Are we caught up now? Good! On to the review! In the beginning of this issue, we see what we’ve been dreading: Darkseid has returned! Though not fully complete, Darkseid still needs the help of the Injustice Society’s Shade, Icicle, and Fiddler, to fully return him to reality. It won’t be easy though, as members from the JLA, JSA, and New Gods will try to stop them! Power Girl, Firestorm, and Orion are nearby, and they’ve got plenty of reason to bring a beat-down. Shade takes Orion out quick, but not before Firestorm returns the favor to Shade! Icicle immobilizes Firestorm, but before Power Girl and a refreshed Orion give him a double knuckle sammich! I guess that’s one way to “break the ice“, if you know what I mean! This whole time, Fiddler has been playing his evil tunes to help Darkseid reign his evil once again. He stops, but only for a moment, before turning his notes of horror on this small trio of good. As the notes play, down they go, one by one, as they succumb to their worst fears. Now that they are out of the way, Fiddler returns once more to his task at hand: the revival of Darkseid! Wow! That’s only the first seven pages! I love Gerry Conway’s work. His work on Superman helped me to not only get into, but immensely enjoy the character. His story is masterful, experienced, and thought out. It shines here, as he takes on the major task of not only writing the Justice League, but also the JSA and New Gods on top of that. With Jack Kirby’s creation, Conway writes one helluva story, bringing to life the action and drama required to sell a story this huge. Though the action is swift and adrenaline filled in the first part of the issue, it’s the middle that holds as my favorite. We see Superman, Wonder Woman (from Earth-2) and Barda wondering the sewers, directly underneath the nastiness that is Granny Goodness, looking for the Apokolips resistance fighters. Supes and Wonder Woman have small parts, and it’s Barda who stands out the most. Here is where it’s character driven, and not dependent at all on action. It flows just as good, and holds just as much weight as the other parts of the story, but here I think it resonates more. Conway writes each character as it’s own, never carbon copying to make it easier. Barda reacts her own way, as does Superman, or even Batman, Huntress, and Mister Miracle in the third part of this story. It’s exciting to read, and a great joy to be a part of. George Perez is a legend in the industry, and issues like these show us why. His lines are precise, his attention to detail, in my opinion, is unmatched, especially during this time period, and homage to Kirby’s New Gods creation is excellent. Perez holds true to the foundations Kirby set, and yet still makes them his own. Barda’s suit looks amazing, and the entire city structure of Apokolips will blow you away. The best page penciled, though, is on page ten, when we get a view from the top, down of the resistance fighters. It’s dizzying in it’s detail, but the dimensions are defined to give it depth and scope. The Kirby particles are a great touch too. Perez also does great expression here too. The expression given by Mister Miracle when he discovers what Darkseid plans to do next is shock, and Perez pencils it nicely. Hell, this whole issue can be a testament to just how awesome George Perez is at his work, which only gets better from here. We see that, not only in Crisis on Infinite Earths, but also when he went to Marvel to start Infinity Gauntlet. It truly is amazing stuff. Like I said in my Flash review a few weeks ago, sometimes it’s just good to sit down and enjoy a comic. Comics from this day and age are long since past (with the exception of DC’s new title Batman ’66), and it’s an age I sorely miss. Lucky for me though, I have boxes of comics from this time period just waiting to be read. These are the types of comic I want my kids to start reading. These are the types of issues that I want them to sit and immerse themselves in this world, and gasp when Batman gets caught, cheer when Superman punches the bad guy through the next fifteen walls, and smile at the tested but true love that Barda and Mister Miracle hold for each other. It truly is amazing stuff, and what with comics nowadays that are very drama oriented and 6+ issues arcs, it’s good to come back to how things used to be, and just enjoy. Parental Concern: None. 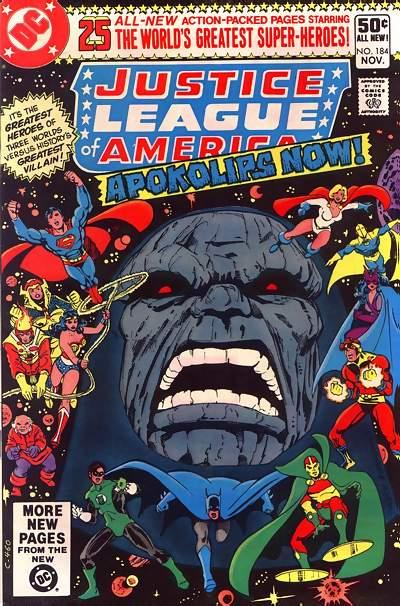 Fear for the planet of Apokolips, though, as it’s about the host the showdown of the century!